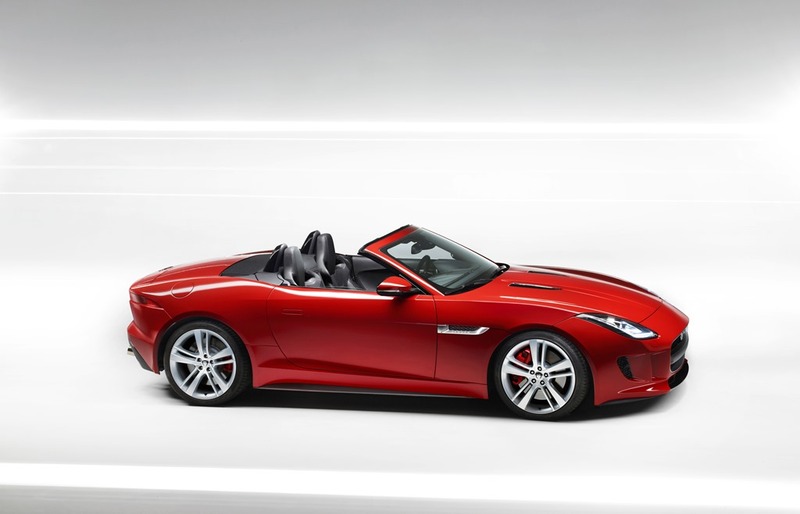 JAGUAR F-TYPE: Could it be the best looking Jag since the E-Type? The new Jaguar F-TYPE represents a return to the company’s heartland: a two-seater, convertible sports car focused on performance, agility and driver involvement. The F-TYPE is a continuation of a sporting bloodline that stretches back more than 75 years and encompasses some of the most beautiful, thrilling and desirable cars ever built. The engineering ethos underpinning the F-TYPE is centred on Jaguar’s industry-leading expertise in the use of aluminium. Featuring the most advanced iteration of Jaguar’s acclaimed rigid and lightweight aluminium architecture to date, the F-TYPE has ideally balanced weight distribution that allows its involving rear-wheel drive dynamics to be explored to the full. Utilising extensive Computer Aided Engineering programmes, the attention to detail involved in the F-TYPE’s creation even extended to the development of a new, lighter, aluminium front subframe. Three variants will be available at launch – F-TYPE, F-TYPE S and F-TYPE V8 S. Each is distinguished by the power output of its supercharged petrol engine with all engines featuring stop/start technology to maximise efficiency. A new 3.0-litre V6, developed from Jaguar’s highly acclaimed 5.0-litre V8, is available in either 250kW or 280kW variants, powering the F-TYPE and F-TYPE S respectively. Both applications exhibit the same free-revving, willing nature that encourages the enthusiastic driver to explore the full extent of the engines’ abilities. 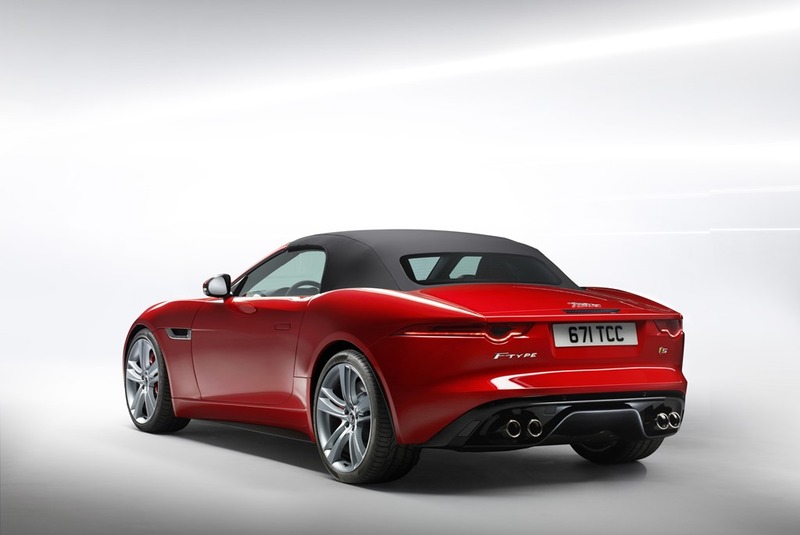 The V6 models are joined by a newly developed member of Jaguar’s V8 engine family. Producing 364kW and 625Nm of torque in the F-TYPE V8 S model, it has an astonishing torque-to-weight ratio of 375Nm/tonne, accelerates to100kph in 4.3 seconds and on to an electronically limited top speed of 300km/h while emitting 259g/km of CO2. The 280kW V6 F-TYPE S covers the 0-100kph sprint in 4.9 seconds and has an electronically limited top speed of 275km/h, with CO2 emissions of 213g/km. The 250kW V6 F-TYPE accelerates to 100kph in 5.3 seconds and on to an electronically limited top speed of 260km/h, while emitting just 209g/km of CO2. The company’s eye to the future is encapsulated in the assertive design language that deliberately challenges preconceptions. Jaguars have always defined sinuous, muscular simplicity and the F-TYPE is no exception, its shape being defined by two ‘heartlines’ forming the front and rear wings. 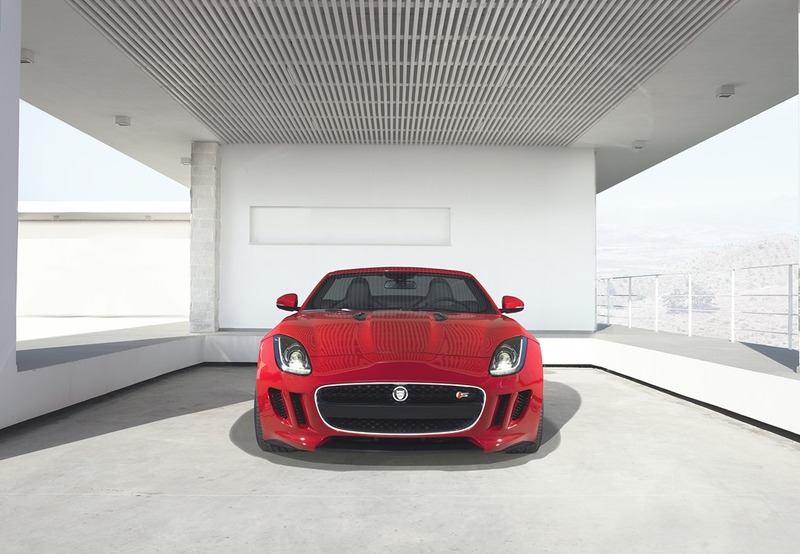 Taking inspiration from the C-X16 concept unveiled in 2011, the front of the F-TYPE features a new interpretation of the bold angular Jaguar grille from which flows the muscular clamshell bonnet with its signature ‘power bulge’. The all important heartline begins its journey in the blade dissecting the shark-like gills on either side of the grille before leading the eye to the top of the front wing, emphasised by the bi-xenon headlamp and integral LED daytime running lights, into the door and towards the rear of the car where it gracefully disappears. The focus on driver involvement and sporting performance in the F-TYPE is emphasised by the ‘one plus one’ layout of the asymmetric cabin. This is evidenced by the grab handle which sweeps down the centre console on the passenger side, delineating it from the driver’s position. Further differentiation is provided by the use of different trim materials either side of the cabin, with a more technical finish on the driver’s side. 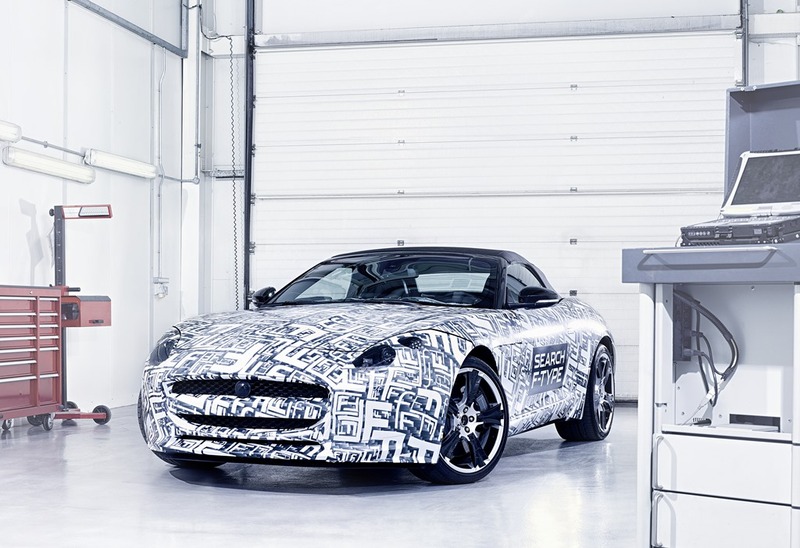 Jaguar’s expertise in aluminium vehicle architectures was essential in making the F-TYPE the very special car it is. 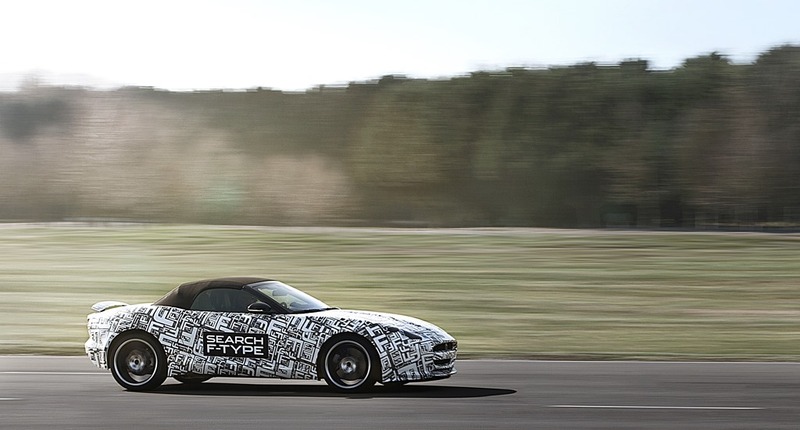 Having pioneered the use of aluminium monocoque construction in volume production, Jaguar’s engineers were able to apply more than a decade’s worth of experience in this type of manufacture to achieve the twin goals for the F-TYPE of low mass and an extremely rigid body. Key to this was the further development of Jaguar’s alloy technology to deliver increased structural integrity while reducing weight. AC300, a crash-crush 6000-series alloy was refined specifically for the F-TYPE application to provide levels of strength comparable to the existing high-performance XK platform – for which it was first developed – while offering considerable weight savings. 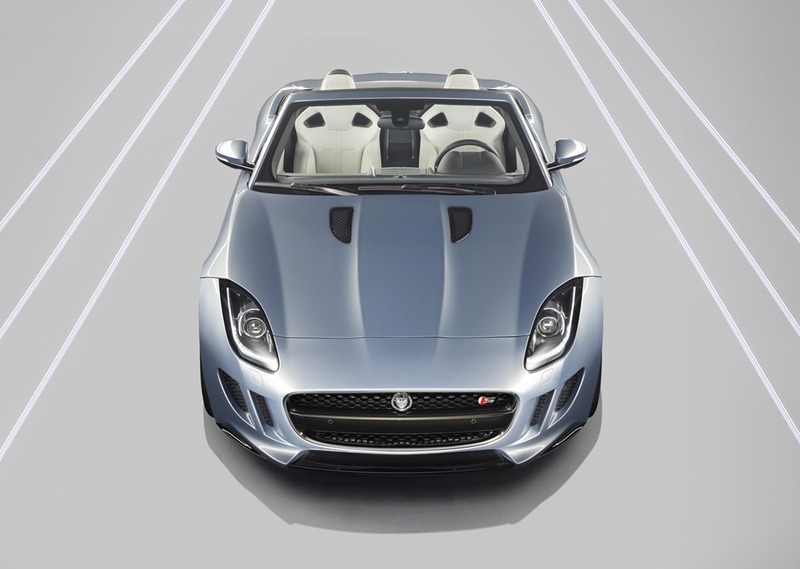 As a result the F-TYPE core body-in-white weighs just 261kg. This has obvious benefits in terms of the F-TYPE’s overall levels of directional agility, acceleration, braking, economy and emissions. Concentrating more of the mass within the wheelbase by minimising the front and rear overhangs also provides the car with an inherent stability to further inspire driver confidence. The F-TYPE’s driving position is 20mm lower than in the acclaimed XKR-S, dropping the centre of gravity and allowing the driver to feel at one with the car. In addition to the structural alloy, Jaguar further developed a skin panel alloy in order to deliver the desired design language. This AC600 alloy offers the same robustness and quality of finish as the existing metal used on the XK but with much greater formability to provide greater clarity and tightness of radii and feature lines. This allowed, for example, a reduction in radius of more than 50 per cent, down to just 8mm, to allow the engineers to reproduce the all-important ‘heartlines’ exactly as the designers had intended. Incredibly, the beautiful clamshell bonnet, an exotic signature feature of the car and where the front heartline begins, is a one-piece stamping, made using a 1000-tonne press. Jaguar also developed new techniques in order to deliver both the design and engineering integrity expected of the F-TYPE. One example of this is the use of a process known as ‘warm forming’ in order to produce the inner door pressing. Too complex to be achieved through the ordinary stamping process with cold metal, Jaguar’s engineers developed an industry-first method in which the metal is heated to 260°C before being pressed in order to deliver the desired shape and structure within one large pressing rather than a number of smaller ones which would have added weight. Weight savings have been achieved in a number of key areas, using a number of different techniques. Optimisation of the body-in-white design achieved an overall reduction of 35kg while obsessive attention to detail shaved 2kg each from the windscreen, cooling pack and induction system. The engine mountings and bumper beam also each contributed 5kg savings while powertrain optimisation saved 8kg. The new alloy front subframe saves a further 5kg compared to a steel equivalent. 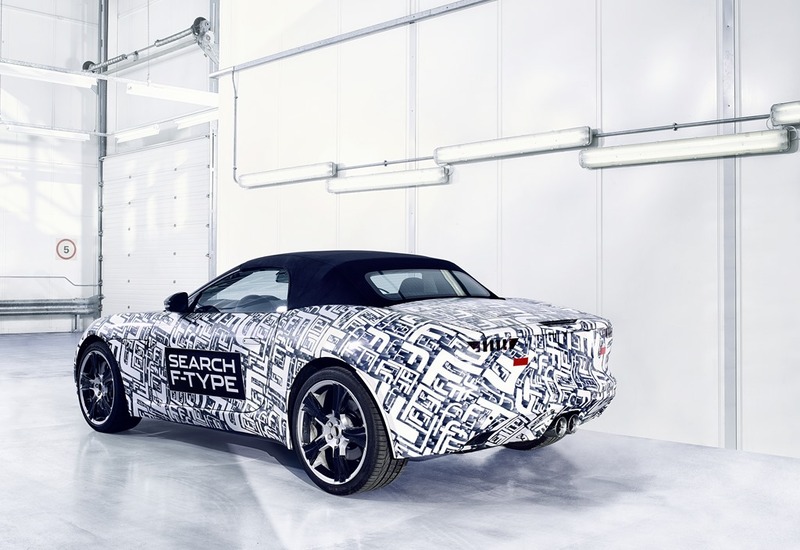 The F-TYPE also has more composite materials than in any previous Jaguar with crash-management structures under the sill and the boot lid constructed from high-strength plastics. Further weight savings in the construction of the F-TYPE came from the hood system which saved 12kg, An impressive 24kg was saved by optimising seat construction and mounting. 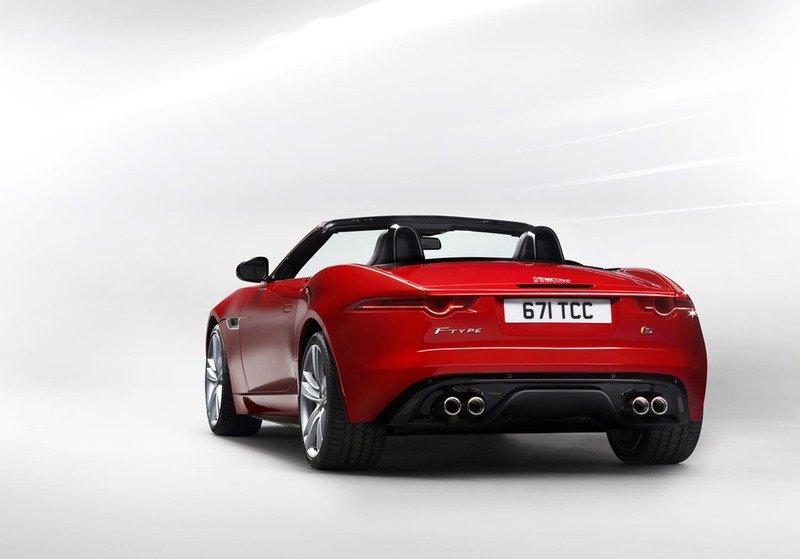 As a result, the F-TYPE weighs from just 1597kg. Aluminium forms a great part of Jaguar’s commitment to sustainability with more than half the content of the car coming from recycled metal. 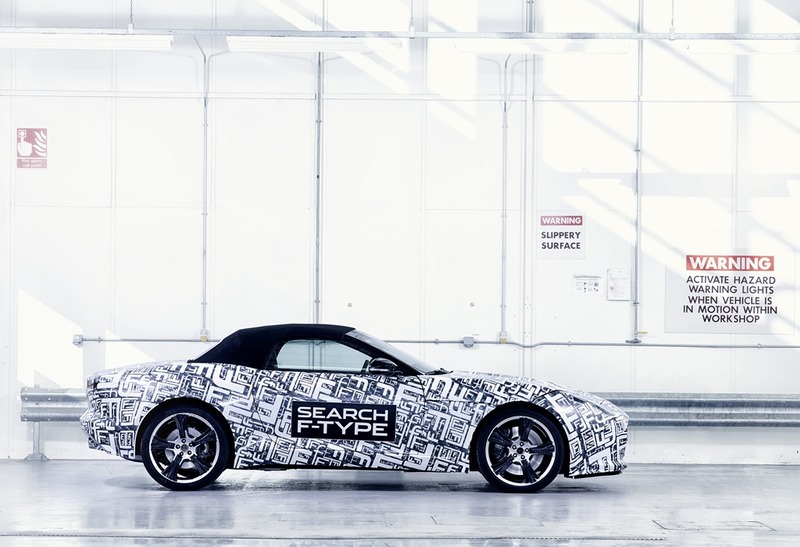 In addition, the F-TYPE’s structure is exclusively riveted and bonded – this manufacturing process emitting up to 80 per cent less CO2 compared to that from welding a comparable steel structure. Jaguar is also rolling out its closed-loop recycling system to its suppliers, ensuring all offcuts of metal from the manufacturing process are reused. 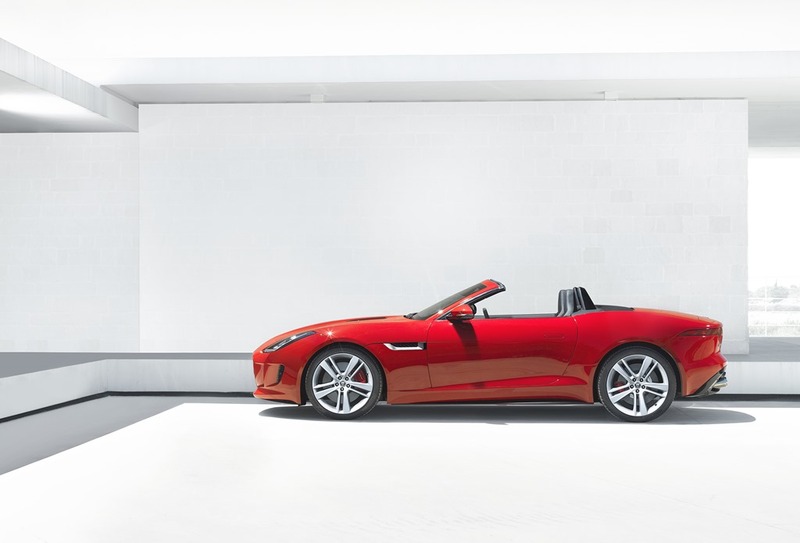 The F-TYPE provides the perfect showcase for Jaguar’s next generation of supercharged petrol engines, which combine extremely high specific outputs of both power and torque with great efficiency gains. Exclusive to the F-TYPE S is a 280kW and 460Nm version of the 3.0-litre V6 supercharged engine that was introduced to the 2013 model year XJ and XF saloons in 250kW and 450Nm form; that 250kW engine also being offered in the F-TYPE. Based on the highly acclaimed 5.0-litre V8 engine, now in its third generation, the V6 shares its all-alloy construction format, with the lightweight die-cast block stiffened with cross-bolted main bearing caps, increasing rigidity and refinement. The four-valve cylinder heads are constructed from recycled aluminium, with the valves themselves controlled by a dual independent variable cam timing system activated by the positive and negative torques generated by the movement of the intake and exhaust valves. With actuation rates of more than 150 degrees-per-second, the timing system optimises power, torque and economy while giving the V6 a distinctly urgent and responsive character, encouraging the driver to make full use of the entire rev range. This responsive and uninterrupted power delivery is made possible through the use of spray-guided direct injection. This delivers precisely measured quantities of fuel directly into the centre of the combustion chambers at pressures of up to 150bar, creating a more homogenous air-fuel mixture for cleaner and more efficient combustion. This is aided by spark plugs which are precisely oriented both in relation to the injector and within the combustion chamber. The compression ratio is also raised from 9.5:1 in the supercharged V8 to 10.5:1, further improving fuel economy and reducing CO2 emissions. Mounted in the ‘V’ of the engine is the latest-generation Roots-type twin vortex supercharger, its use key to the 3.0 V6 S/C’s high-specific output and efficiency. The use of supercharging avoids pumping losses caused by increased back pressure in larger capacity turbocharged engines, improving both efficiency and urgency of response. More compact than the supercharger used with the V8, a water intercooler reduces the temperature of the intake air to optimise power and efficiency. The supercharger boost control is supervised by new Bosch engine management software, optimising efficiency. 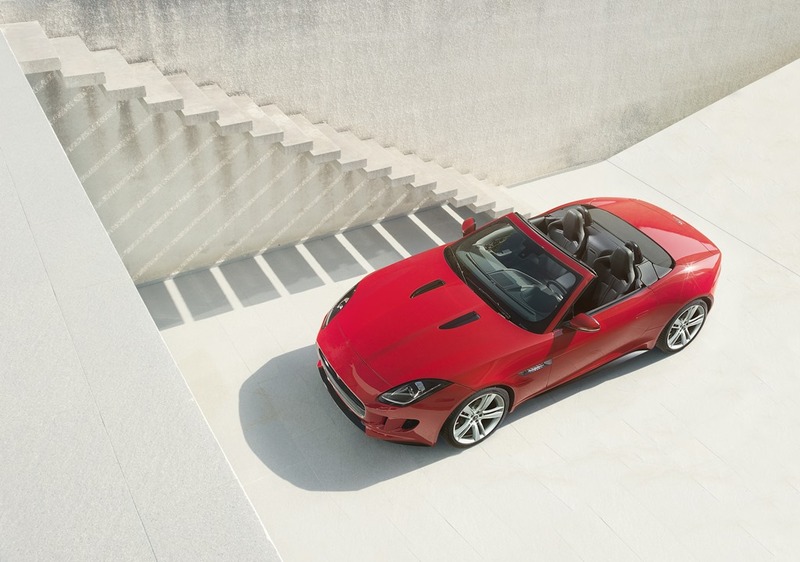 Underlining the 250kW F-TYPE’s headline performance figures of 0-100kph in 5.3 seconds and electronically limited 260kph top speed is mid-range acceleration from 80 to 120kph in 3.3 seconds. In its 280kW state of tune, in the F-TYPE S, that 80-120kph sprint is covered off in 3.1 seconds; complementing its 0-100kph time of 4.9 seconds and electronically limited top speed of 275kph. 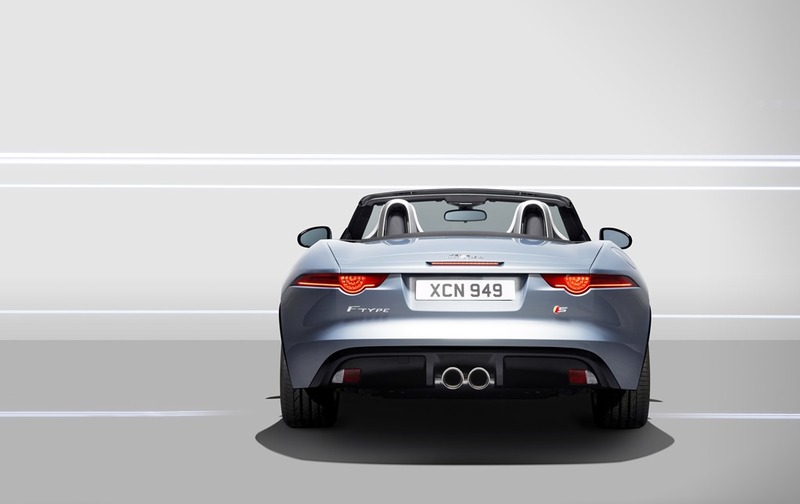 The F-TYPE and F-TYPE S achieve CO2 emissions figures of 209g/km and 213g/km respectively. 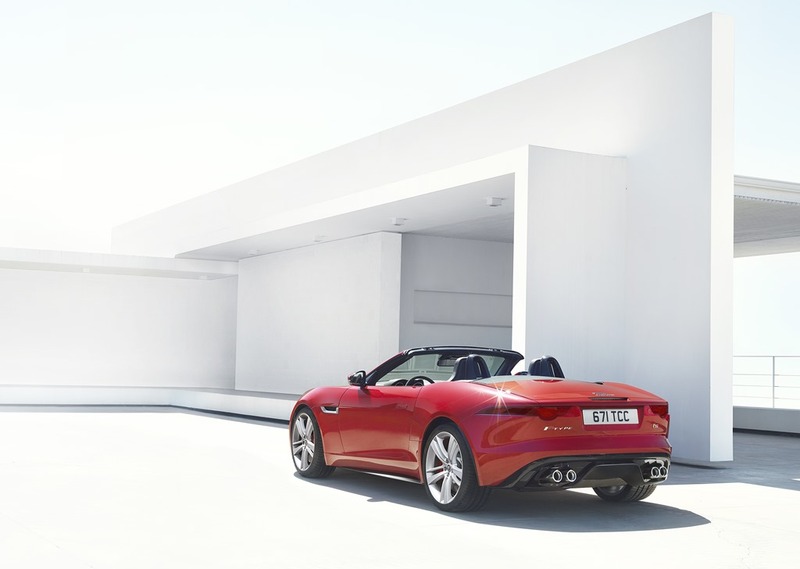 The final model in the F-TYPE line-up is the V8 S, which is powered by a new variant of the Jaguar’s supercharged 5.0-litre V8 tuned to provide 364kW and 625Nm of torque in this smaller, lighter and more agile application. This allows it to achieve headline figures of 0-100kph in 4.3 seconds with an electronically limited top speed of 300kph, 80kph to 120kph taking a mere just 2.5 seconds. CO2 emissions are 259g/km. Both the V6 and V8 S models are fitted as standard with an Active Exhaust system (which is optional on the 250kW model). 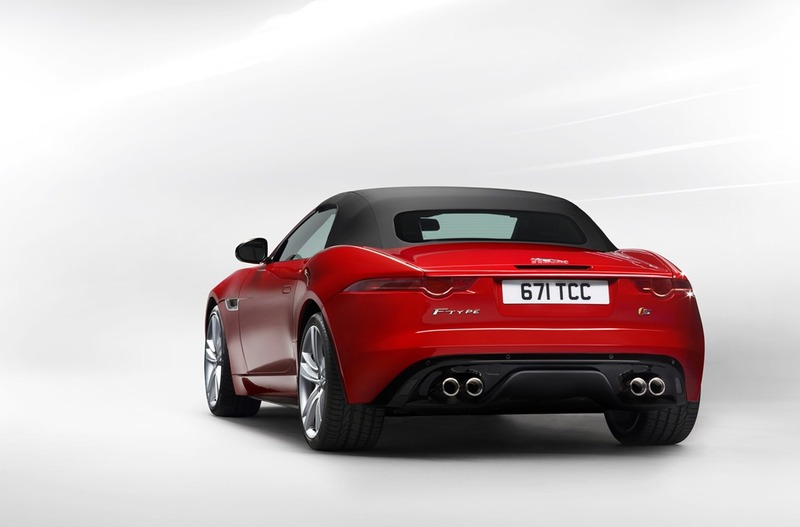 This takes the aural excitement delivered by the F-TYPE to new levels, utilising a number of electronically controlled bypass valves in the rear section of the exhaust which open under hard acceleration to enhance sound quality, effectively altering the exhaust gas routing into a free-flowing straight-through arrangement. Carefully developed though more than 85 iterations, the Active Exhaust offers an authentic, rich sound, developing to a howling crescendo as the upper limits of the rev range are reached. In addition to the bypass valves opening under load they can be instructed to open full-time by selecting Dynamic Mode using the Jaguar Drive Controller – which also optimises throttle response, gearchange, steering and suspension systems – or via an optional override button. In order to ensure the driver gains maximum benefit from the system, the acoustic tuning in the rear of the car allows more of the exhaust noise to be heard in the cabin. An Intake Feedback System allows the driver to also experience what is occurring within the intake manifold, which is particularly exciting when combined with the scream of the supercharger spooling up to speed. 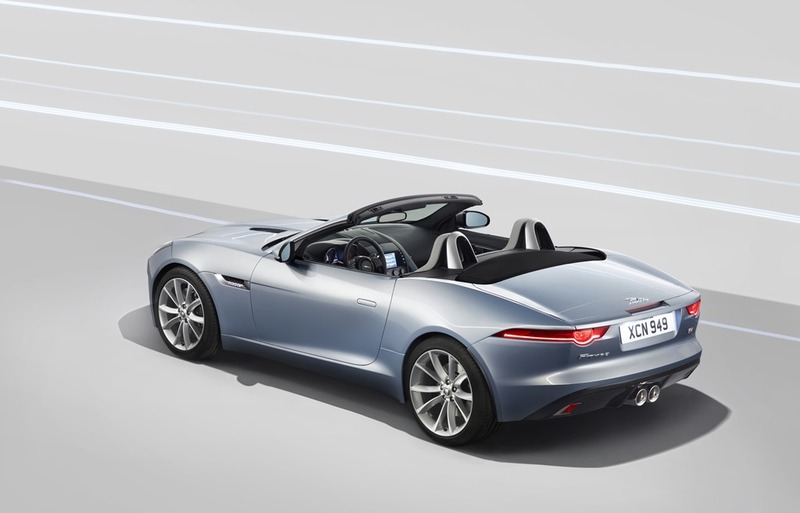 With eight, closely-stacked, sporting ratios in the ‘Quickshift’ transmission, the F-TYPE driver can fully exploit the rev range and ensure the engine remains within its optimal power band with every gearchange. The transmission has been specifically optimised by Jaguar’s engineers for a sports car application to prioritise acceleration throughout both the rev and speed range. In order to make every gearshift as connected as possible, the entire drivetrain of the F-TYPE – up to and including tyre contact patches – is tuned for optimal stiffness to allow the transient torque delivery to be made much quicker, meaning the engine responds more keenly and accurately to the demands made by the accelerator. Additionally, once the transmission has shifted into second gear, a locking clutch removes the torque convertor from the equation, creating a direct mechanical link between the engine and the driven rear wheels. The sense of connectivity extends to the gearchanges themselves, which have been made significantly shorter and more immediate in action – a system known as ‘Quickshift’. This has been achieved via rapid and precisely timed engine torque intervention during upshifts. This creates a much shorter and crisper sounding shift while utilising the engine inertia to deliver a positive acceleration feel for the duration of the gearchange. The operating parameters of the transmission are determined by the adaptive shift strategy which has 25 different programmes available to it, depending on driving style and road conditions. The transmission can detect the manner in which the car is being driven by monitoring acceleration and braking, cornering forces, throttle and brake pedal activity, road load, kickdown request and even whether the car is being driven up or down hill. On detecting a more urgent driving style, the transmission will automatically make the gearshifts more aggressive and move the shift-up point to higher in the rev range. The transmission also features a number of functions that specifically relate to the enthusiastic manner in which the F-TYPE will be driven. In order to keep the car balanced during a downshift, the transmission will instruct the engine management system to automatically blip the throttle to match engine revs. This function also allows the transmission to perform multiple and very rapid downshifts during hard braking. Corner Recognition senses when the car is negotiating a bend, the transmission holding its ratio to ensure the correct gear for the exit. The transmission will also recognise when the car is performing a series of overtaking manoeuvres requiring rapid changes in throttle position and, rather than change up, remain in a lower gear ready for the next demand for acceleration. Manual override of the transmission is available to the driver at any time, using either the steering wheel-mounted paddles or the central SportShift selector. Moving the selector to the left accesses manual mode in which pushing the lever forward selects a lower gear and pulling it back instructs an upshift. If Dynamic Mode is also selected on the Jaguar Drive Controller, the transmission will not automatically shift up at the redline and will only downshift to prevent engine stalling, leaving control fully in the hands of the driver. The F-TYPE S uniquely offers one additional feature to optimise acceleration from rest: Dynamic Launch Mode. When the car is stationary, the driver depresses the brake pedal while simultaneously building engine speed until a message reading ‘Dynamic Launch Ready’ appears in the instrument panel. The driver then simply has to release the brake pedal while flooring the throttle and the car will do the rest, optimising acceleration. A mechanical limited-slip differential is fitted as standard to the F-TYPE S. The mechanical system was chosen for its authenticity and suitability for a rear-wheel drive sports car, offering the driver the opportunity to explore the car’s superb balance and outer limits of its grip within a progressive and tactile handling envelope. The V8 S model is fitted with Jaguar’s active electronic differential to limit wheelspin, maximise traction and offer even greater control. The Jaguar active differential is operated by an electric motor acting on a multiplate clutch which can transfer torque to the wheel with the most grip. Fully automatic in operation, the system can apply full locking torque almost instantaneously. Working in conjunction with the stability, traction and ABS systems it allows for very fine control of power delivery and always makes the most use of available grip. 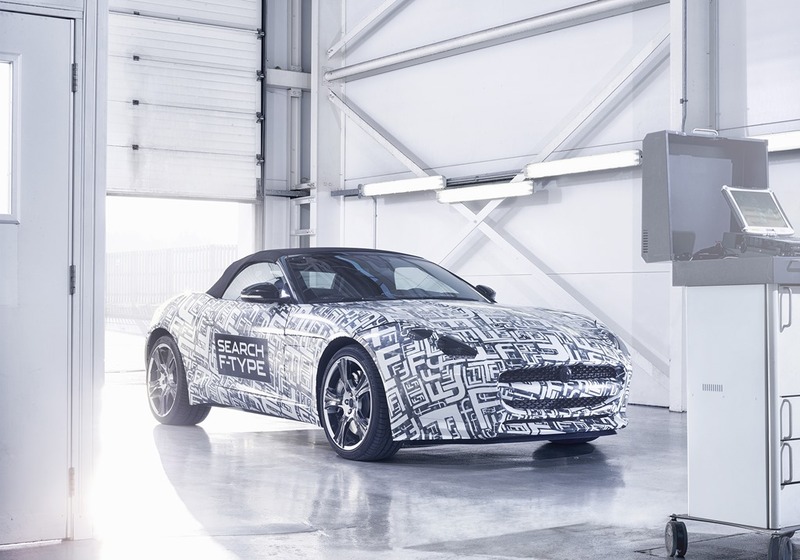 All three variants of the F-TYPE offer progressively more powerful and reassuring braking systems, all with the sporting bite expected of a Jaguar and the high levels of pedal feedback required for accurate modulation. The Jaguar Performance system fitted to the 250kW F-TYPE has 355mm front and 326mm rear brake discs with silver coloured calipers. The F-TYPE S receives the Jaguar High Performance system with 355mm brake discs front and rear with black or red painted calipers. The F-TYPE V8 S uses the Super High Performance system with the largest set of brake discs fitted as standard to a Jaguar production car – 380mm front and rear – with black or red painted calipers. 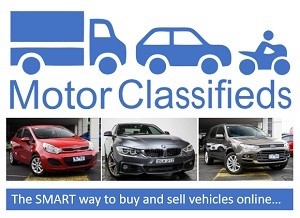 All cars are fitted as standard with ABS, Electronic Brake Force Distribution and Emergency Brake Assist. The use of Computational Fluid Dynamics allowed Jaguar’s engineers to optimise brake cooling, with cold air channelled to the brake discs via the air intakes flanking the grille and by the use of aerodynamically shaped suspension components to direct airflow beneath the car. The F-TYPE also offers the option of Jaguar’s Intelligent Stop/Start system which automatically shuts down the engine when the car comes to a halt and the driver’s foot is on the brake pedal. When the brake is released, the system can restart the engine in less time than it takes for the driver’s foot to move from the brake to the accelerator. The speed of operation of the twin solenoid system also allows for ‘change of mind’ functionality, bringing the engine back up to speed even during its run-down phase if, for instance, the car is coming to a halt at a junction when the driver sees an opportunity to join the traffic flow. The system offers fuel economy and emissions benefits of up to 5 per cent. 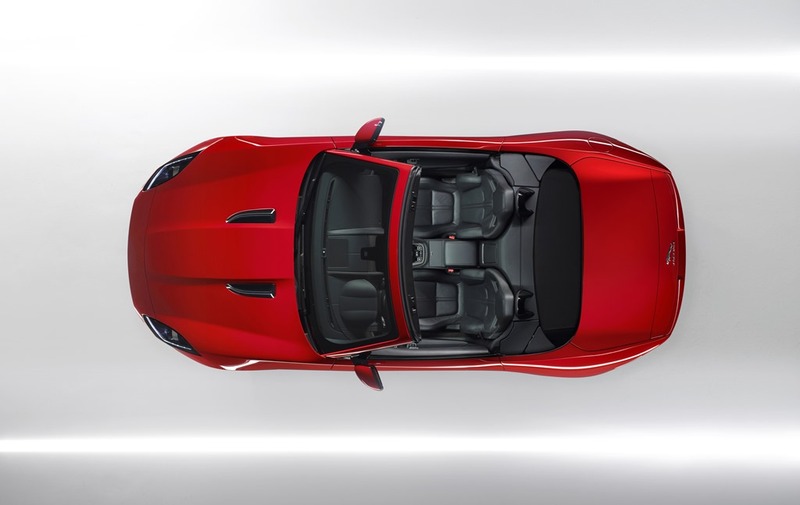 The engineering attention brought to bear on developing the aluminium underbody of the F-TYPE has ensured the best possible basis for offering the connected feel, agility and rewarding driving experience expected of a Jaguar sports car. Every response from the steering to the gearchange, throttle, brakes and suspension has been finely honed to be as connected, accurate and involving as possible. 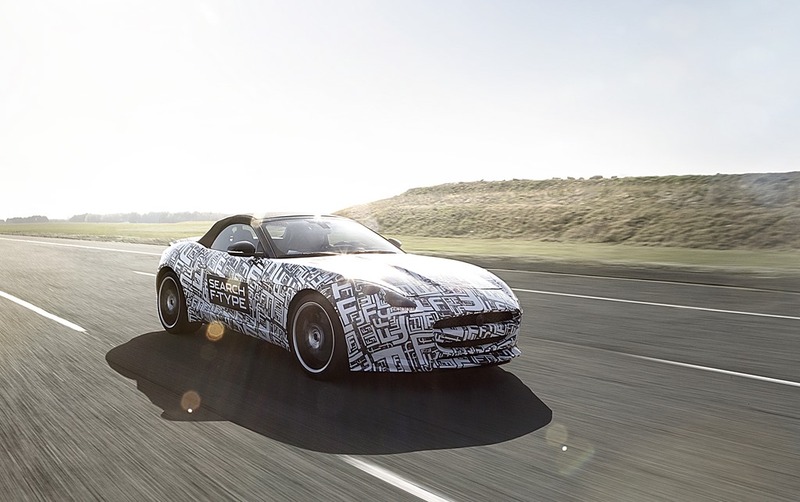 The new structural alloys used in the F-TYPE’s construction result in greatly increased rigidity, which in turn provides the best possible basis for a finely tuned suspension system to deliver an unrivalled feeling of connectivity to the driver. The F-TYPE’s overall torsional rigidity is 10 per cent greater than for the acclaimed all-aluminium XKR-S, but of greater significance are increases in local point mobilities. Using detailed Computer Aided Engineering programmes, gains of up to 30 per cent have been achieved in lateral stiffness in key areas such as the front suspension mounting points. The stiffer the underlying structure, the greater the precision with which the suspension can be optimised for agility, connectivity and fidelity of response. For a planted, wheel-at-each corner stance and greater stability to instil a sense of absolute confidence in the driver, the F-TYPE utilises double wishbone suspension all-round, with a wheelbase of 2622mm and front and rear tracks of 1585mm and 1627mm. Reducing the front and rear overhangs also helps in concentrating the mass within the wheelbase, reducing the moment of inertia and making the car much more immediate to turn in. To gain the greatest benefit from this, Jaguar’s engineers paid particular attention to optimising front to rear weight distribution. Evidence of this obsession with balanced masses comes from the fact that not just the battery but even the washer fluid reservoir has been placed in the boot rather than under the bonnet. The steering provides the most immediate and obvious communication link between car and driver. In order to maximise connected feel, the F-TYPE uses an alloy front subframe which reduces front end weighting, while a stiffer front knuckle, also in aluminium, provides the greatest accuracy in steering response and feedback. This has allowed the fitment of the quickest steering rack ever on a Jaguar. This offers outstanding response while informing the driver of exactly what the front wheels are doing. Every Jaguar is engineered and tuned to achieve an unparalled balance between ride and handling. In the F-TYPE that balance naturally tips in favour of involving, exploitable handling but never allows the ride to deteriorate into harshness. The Dynamic Mode fitted to the F-TYPE enables the driver – at the push of a button – to emphasise the sporting character of the car still further. It does so by sharpening throttle response, increasing steering weighting, performing gearchanges more quickly and higher up the rev range and by allowing a greater level of slip before the stability control intervenes. Selecting Dynamic mode also prevents automatic upshifts when the gearbox is used in manual mode. 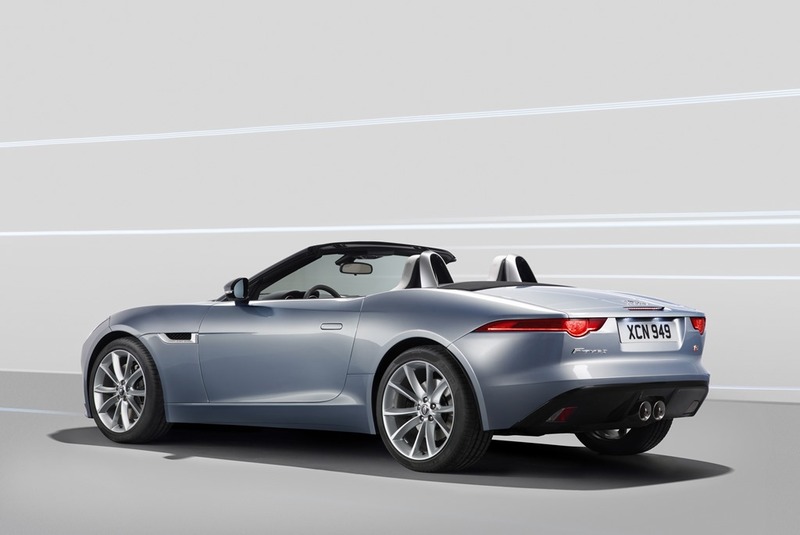 Additionally, the F-TYPE S and V8 S models are fitted with Jaguar’s Adaptive Dynamics system that actively controls vertical body movement, roll and pitch rates. The system continuously monitors driver inputs and the attitude of the F-TYPE on the road, adjusting damper rates accordingly up to 500 times a second to optimise stability and agility. 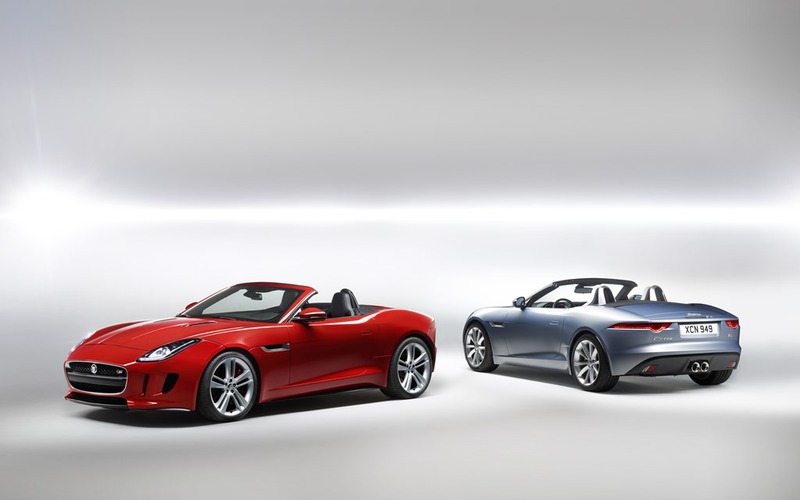 The presence of the Adaptive Dynamics system also allows the F-TYPE S and V8 S to offer a Dynamic Mode with greater functionality for even more focused driving, as in these models it also offers enhanced body control through firmer damping rates. A Configurable Dynamics option is another first for a Jaguar. This allows the driver to select which elements of the Dynamic Mode are required so, for instance, the steering weight and throttle response can be sharpened while allowing the ride to remain unchanged. Configurable Dynamics also adds functionality to the central touchscreen aimed at track use of the car. The system allows drivers to record lap and split times and will provide information on throttle and brake inputs and even G-forces generated. 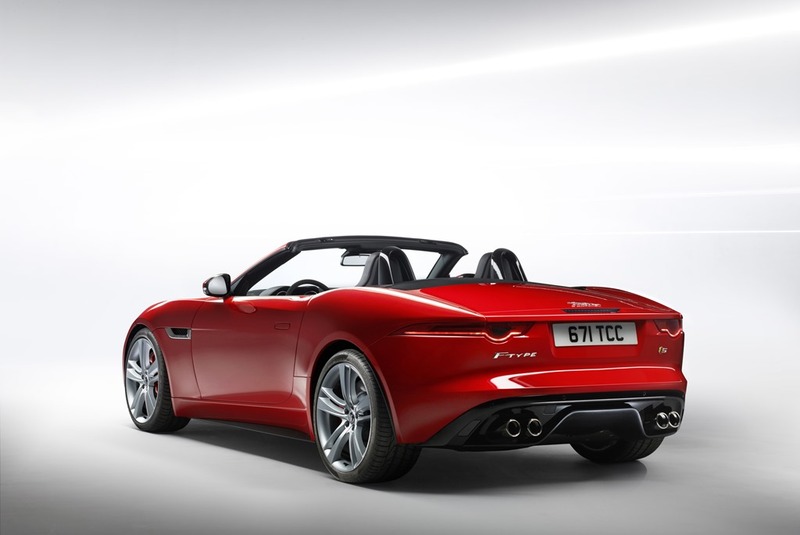 “We wanted the experience of sitting in the F-TYPE to be exciting. A sports car cockpit should be an intimate place and so we aimed to get a sense of the surfaces falling towards and then wrapping around the driver. 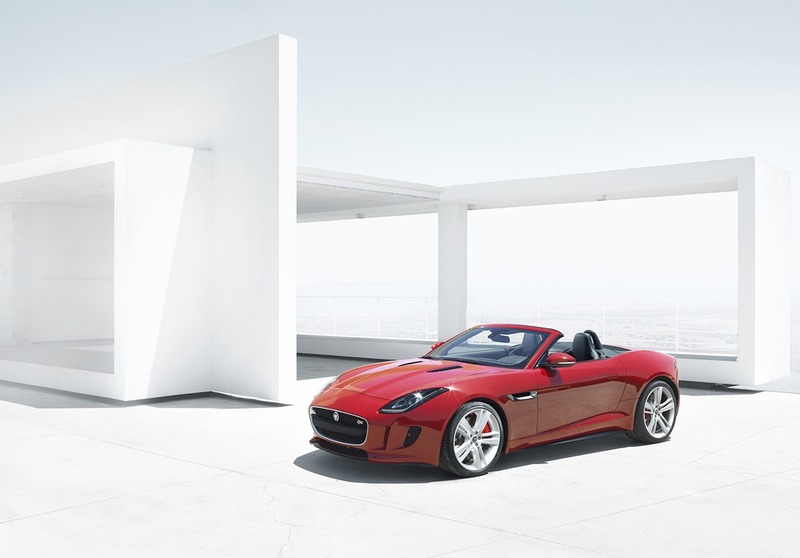 The intent behind the F-TYPE is apparent from the moment the door is opened. The cabin architecture reflects its role as a ‘one plus one’ sports car, focused upon the driver and their interaction with the electronic and mechanical components that come together to create an experience far greater than the sum of its parts. The aim was to create an enveloping cockpit for the driver with all the controls placed naturally to hand and logically grouped so that there would be no distractions from the driving experience. A clear division exists between the driver and passenger sides of the cabin, created in the first instance by the grab handle which sweeps down from the top of the centre console and wraps around behind the SportShift selector and Dynamic Mode buttons, sending the clear message that these are driver interfaces. The handle also, of course, serves as a signal to the passenger that spirited driving could be in store. Further differentiation is provided by the use of different finishes in the driver areas with a more technical grain to the top of the instrument panel and centre console in comparison to that found on the passenger side of the car. In the S and V8 S models, the main control interfaces – the Engine Start button, steering wheel mounted gearshift paddles and Dynamic Mode toggle – are highlighted in an orange finish, Ignis, similar to that used on the markings on professional divers’ watches. The small diameter three-spoke steering wheel is additionally available in a flat-bottomed option. The wheel frames a brace of analogue instruments – very much a Jaguar sports car signature – with the numerals on the rev counter being larger and bolder than those on the speedometer to offer a reminder of the car’s purpose and also subtle encouragement to the driver to exploit the engine’s performance to the full. A TFT screen between the two dials provides further information for the driver as necessary. 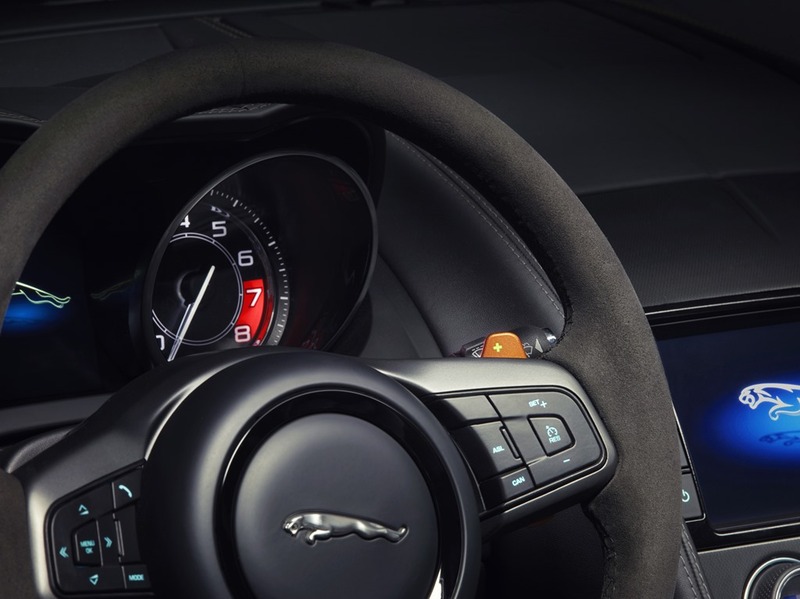 Jaguar pioneered the use of a touchscreen interface for controlling the majority of its cars’ functions but with the F-TYPE it was important that there were more physical interfaces and touchpoints for the driver. The heating and ventilation functions have been separated out from the touchscreen and now have physical controls beneath it. Rotary dials control the climate for each side of the car and feature a screen at their centre to indicate temperature and status. This also allows the controls to fulfil a dual-purpose – in cars fitted with heated seats, pushing the left or right hand rotary controls alters their functionality allowing them to control seat temperature. A row of toggle switches below the dials echoes Jaguar sports cars of the past and control further climate functions. A further example of the pure driving environment is provided by the innovative ventilation system which features deployable vents on top of the centre console. Governed by algorithms within the climate control system, these are hidden until required to provide rapid high-level temperature regulation, at which point they rise up from the top of the centre console. As with all Jaguars, the F-TYPE is luxuriously trimmed, but equally the palette of switchgear colours is deliberately understated and technical to ensure nothing detracts from the driving environment and experience. Switches are finished in soft-feel matte black with white markings for maximum legibility while the highlight accents are deliberately understated satin chrome and dark aluminium. Underlining their greater intent, the two ‘S’ models feature darker finishes than the standard V6. Sports seats featuring electric adjustment of the recline and height functions with manual control of fore and aft movement (the latter in order to save weight) are the standard specification. Optional Performance seats can be supplied with additional side bolstering and prominent wings for greater support during high speed cornering. Both variants can also be specified with full electric adjustment which includes adjustable lumbar and side support. 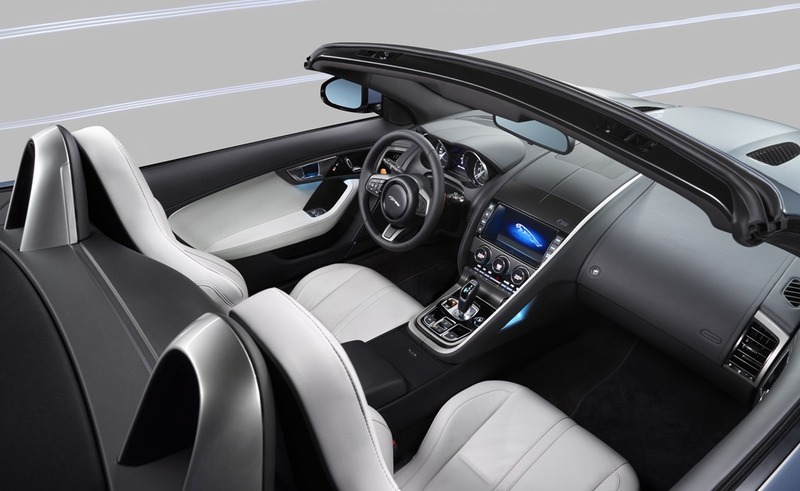 The F-TYPE is available with two audio systems, which come from globally recognised British experts Meridian. These offer either 10 or 12 loudspeakers with outputs of 380W and 770W respectively. The Meridian systems benefit from the company’s huge experience in digital signal processing to create audio reproduction that is second to none. The top of the range offering also features Meridian’s proprietary Trifield System which places both occupants at the centre of their own perfectly focused surround sound field. 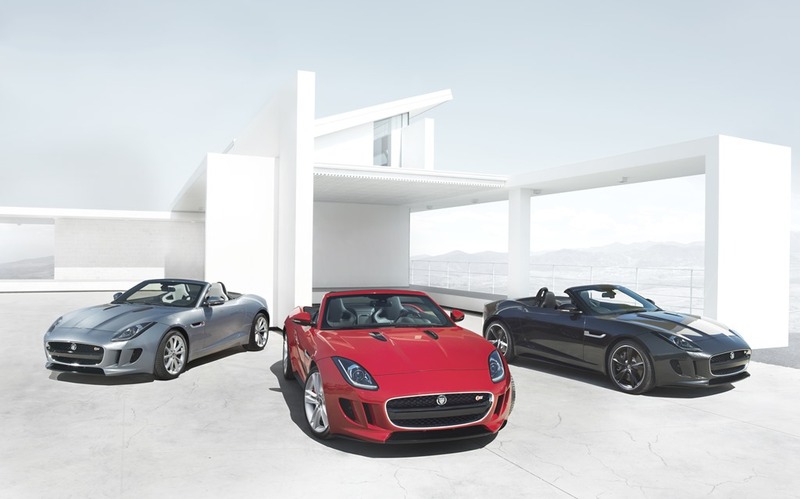 Visual appeal is fundamental to Jaguars and, as such, the F-TYPE is immediately recognisable. The dynamic visual message begins with the formidable grille, which takes the form established by Jaguar’s bold saloons, the XF and XJ, and reshapes it to create a sports car signature, as seen in the stunning C-X16 concept. The grille shape is softer and wider and leans slightly forward to create a suggestion of motion even when the car is stationary. The mesh in the grille and side vents is a new, hexagonal design which gives greater form and depth in comparison to the previous diagonal motif. The grille is flanked by twin ‘shark gill’ openings, intended to give as much visual impact as possible and ensure that the F-TYPE has instant ‘rear view mirror’ recognition on the road. It is from these vents and the grille that the essential form of the car flows and begins to take shape. The one-piece clamshell bonnet stretches back from the leading edge of the grille, incorporating the signature Jaguar bonnet bulge and twin vents. The blade dividing the shark gill openings at the front of the car marks the beginning of one of the ‘heartlines’ that define, in just two bold strokes, both the profile and plan view of the F-TYPE. This first heartline runs up the face of the gill and forms the sharp top crease of the wing line, which, when viewed from the driver’s seat provides not only a visual clue to the potency of the engine under the sculpted bonnet but allows the car to be placed more accurately in a corner. “Every aspect of a sports car, dimensionally, allows us to create something that is visually exciting; visceral as well as physical. To me the definition of sports car design is being fit for purpose, wrapping up the occupants and mechanicals in the most exciting, beautiful and sensual package possible with no unnecessary surfaces or adornment. The importance of this heartline is underscored by the headlamp design which by running vertically rather than horizontally leads the eye naturally up and along the crease rather than interrupting it. This is one of the examples in which technology has facilitated the design language of the F-TYPE – the compact bi-xenon unit requires just one projector unit while the J-Blade LED running lights further emphasise the graphic of the heartline running through the lamp. The heartline continues along the top of the wing before dipping down into the door line and elegantly disappearing into the rear wing. This sweeping line, mirrored by the feature line that runs back from the side vent and the ‘lightcatcher’ surface detailing above the sill instils a sense of speed and spontaneity to the profile of the car. The presence of the lightcatcher also allows the door surface to wrap around the side of the car, creating a fuselage effect. The top of the side vent is formed by the lower edge of the clamshell bonnet. The vent itself is stamped with the Jaguar name. A further example of using technology in delivering design purity is found in the deployable door handles. Until activated by either unlocking the car with the key fob or the driver pressing a touch sensitive area of the handle, these remain flush with the door panel. Stamped with the Jaguar name, their automatic deployment provides a mechanical ‘handshake’, inviting the driver and passenger to enter. Once on the move, the handles retract, creating an aerodynamically uninterrupted surface. The second heartline begins its journey at the rear edge of the door, swelling outwards and upwards to create a strong haunch, emphasising that it is the rear wheels that are providing the motive power. The heartline then drops down and wraps around the sweeping tail in an unbroken curve, forming a low, wide and elegant tail. 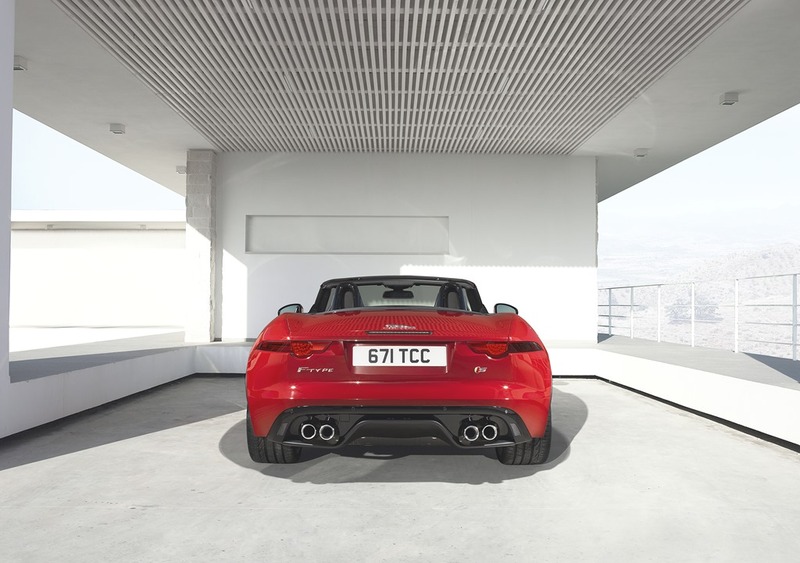 In order to achieve this important aesthetic element, the F-TYPE features a hidden rear spoiler which raises at speed in order to balance front and rear lift. The spoiler raises at 100kph and then lowers to fit flush when the speed drops below 70kph. Further discreet aerodynamic aids are provided by a front splitter and a sculpted rear valance to ensure the car’s balanced weight distribution is echoed in the way it cleaves the air. The width of the tail is emphasised by the slim, full-LED lamps that wrap all the way around the wings almost to the trailing edge of the rear wheelarches. These lamps feature hidden-until-lit technology, appearing solid until one of their functions is activated. In order to achieve such elegant proportions, the reversing and fog lamps are mounted in the lower valance. Reflecting the manner in which the front grille leans forward, the tail actually tucks inwards, creating the impression that the car is actively waiting to leap forward into action. The tailpipes provide an opportunity to differentiate between the V6 and V8 variants. V6 models feature a twin centre tailpipe treatment in a nod to past Jaguar sports cars. The biggest and boldest exhaust finishers ever fitted to a Jaguar, these are stamped from one piece of stainless steel creating an unbroken gleaming surface. The V8 model is marked by the use of the signature quad, outboard-mounted tailpipes as seen on XKR and XFR models. A different rear valance allows for the changed exhaust positioning. Further detail differentiation between the three variants is found in the trim used to highlight elements of the exterior design. The V6 model is marked by satin black trim elements in the grilles, vents, front splitter and rear valance while the two ‘S’ models receive gloss black finishes in these areas. The V6 model sits as standard on 18-inch alloys, with 19-inch and 20-inch wheels optional, these being standard for the S and V8 S respectively. The range-topping V8 S also receives additional aerodynamic addenda – front vanes beneath the shark gills and flat side sill extensions – to aid its stability at the very high speeds of which it is capable. Fitting with its intent as a focused sports car, the F-TYPE is equipped with a traditional fabric, rather than metal, convertible roof. This not only represents a significant weight saving but optimises packaging and helps maintain a low centre of gravity for greater agility. The hood itself can be fully raised or lowered in just 12 seconds at speeds of up to 50kph. Its multi-layer construction includes a thick Thinsulate lining for optimal thermal and sound insulating properties. “We are creating a new generation of Jaguar sports car so it has to be credible from both a performance and design point of view,” explains Mark White, Chief Engineer, Body Complete. “It has to deliver, has to be a great handling car with a stiff, rigid platform underpinning it and it has to look every inch an icon. “For our team the greatest satisfaction was delivering a structure that underpinned the desired performance attributes – ride, handling and agility – by increasing stiffness and at the same time reducing weight. 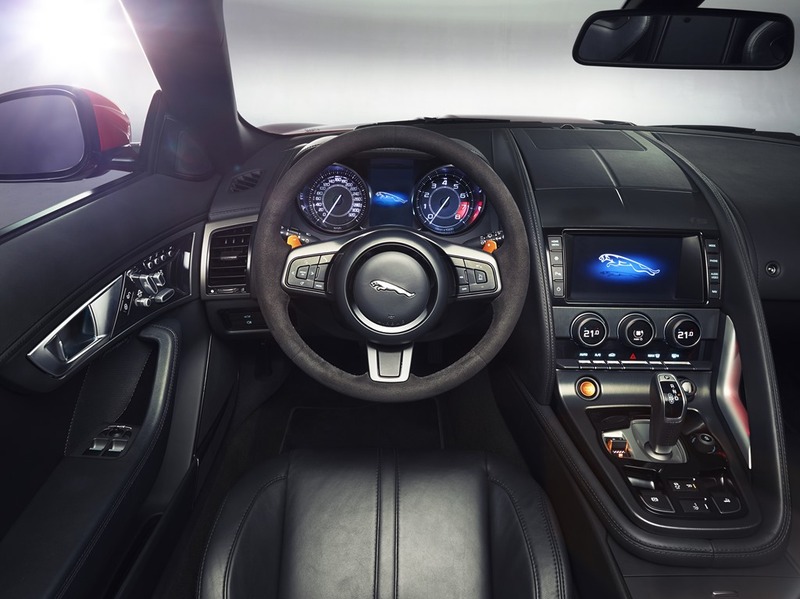 Furthering its understanding of extremely responsive engine and transmission systems, Jaguar has an ongoing relationship with the Institute of Sound and Vibration Research (ISVR) at the University of Southampton. Working with Professor Michael Griffin, a world expert in human responses to vibration, Jaguar has researched how sound and motion can help deliver the most responsive and involving drive. Tim Clark, Technical Specialist for Performance and Driveability Attributes explains: “There is more to rapid gearshifts than the oft quoted and simplistic ‘shift times’. Perception is influenced by complex sound and motion cues, and to maximise their positive influence we initiated a study with ISVR to understand the physical and aural characteristics of a shift event. “Using a motion simulator with sound generation capabilities, volunteers were exposed to many timing combinations of physical acceleration and sound cues, initiated by themselves via a paddle shift, a task which would have been much more difficult to replicate in a vehicle. “Jaguar has a unique legacy of sports cars so the global expectations for the F-TYPE are immense,” explains Ian Hoban, Vehicle Line Director. “Developing it was therefore not just a great privilege but also a huge challenge. “A Jaguar sports car is more than speed in its absolute sense, it is about its agility and its reactions to driver inputs, those millisecond responses to create a connection with the vehicle. This pure and predictable level of response is what enables the driver to exploit the potential and capabilities of the car as well as their own. “This is the car that as a team, we have always wanted to do,” explains Director of Design Ian Callum. “It was very much a team operation because we work very closely together and have a strong shared aesthetic. “To begin with, I will let people express themselves as to what they think a Jaguar sports car should look like. Of course I will have a view in my head but I won’t impose that on them. It’s important because great things come out of it. “It’s an iterative process, it’s about problem solving. Not just the functional and the practical but how to make that line work with that one or that form with another. The whole process is very intimate, very detailed and comes from the first sketches. *For cars fitted with 20-inch wheels. Manufacturer’s figures. Correct at time of going to press.